Manufacture Name : Alcon Laboratories Ine. What is Brinzolamide Opthalmic Suspension? Brinzolamide Opthalmic Suspension as the name suggest is an eye care medication. It reduces the amount of fluid in the eye which lowers pressure inside the eye. High intraocular pressure or IOP (fluid pressure inside the eye) is a major risk factor for glaucoma. Brinzolamide Opthalmic Suspension is mainly prescribed for the treatment of some types of glaucoma and other causes of high IOP. 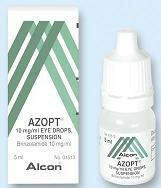 Brinzolamide Opthalmic Suspension is sold under various trade names, one of which is Azopt (made by Alcon Laboratories Inc). Do not use Brinzolamide Opthalmic Suspension if you have a known allergy to Brinzolamide. Also, before using this medication, inform your doctor if you are allergic to any other drugs, or if you have narrow angle glaucoma. Do not put any other eye drops into your eyes unless or otherwise advised by your doctor. Allow at least 10 minutes between two different types of eye drops if you must use two eye drops. Brinzolamide Opthalmic can cause blurred vision temporarily. Be extra careful while driving or doing anything which requires a high level of vision clarity. Brinzolamide Opthalmic is a FDA pregnancy category C drug. It may harm an unborn baby if it is used while being pregnant. It is not known whether it can pass into breast milk and harm a nursing baby. Notify your doctor in advance if you are pregnant, planning to become pregnant, or breast feeding a baby. Before taking Brinzolamide Opthalmic (Azopt), take care of all precautions mentioned above and discuss them with your doctor. How should I use Brinzolamide Opthalmic Suspension? Use Brinzolamide Opthalmic Suspension (Azopt) strictly according to your doctor’s direction or according to the instructions on the medication label. Do not alter the dosage unless your doctor advises you to do so. Do not put Brinzolamide Opthalmic eye drops while you are wearing contact lenses. This medication may have a preservative ingredient which can be absorbed into the soft contact lenses. Ensure a gap of at least 15 minutes after putting the eye drops before you wear your contact lenses. Ensure a high degree of hygiene while handling Opthalmic drops as chances of contamination are high. Avoid touching the tip of the medication bottle or dropper as well as protect it from contact with any surface. Put the Brinzolamide Opthalmic drops as advised by your doctor or as mentioned in the instructions. Putting an eye drop is quite simple and doesn’t require much assistance. Always store Brinzolamide Opthalmic in a cool and dark place. Keep the bottle tightly closed when not in use. What if I forgot to take a dose of Brinzolamide Opthalmic? Do not miss a single dose of Brinzolamide Opthalmic. However, if you miss a dose, take it as soon as your remember it. Do not take the missed dose if the time to take the next dose is almost up. Instead continue with the original schedule. Never take multiple doses closer to each other. An overdose of Brinzolamide Opthalmic is not expected to cause any serious effects. However, if you think that you have overdosed on this medication, seek medical attention right away or call the Doctor immediately. Brinzolamide Opthalmic may cause blurred vision for sometime after putting it in your eyes. Do not indulge in any activities that require alertness and proper vision such as driving. Do not use other eye drops while using Brinzolamide Opthalmic ophthalmic solution unless or otherwise advised by your doctor. But leave a gap of at least 10 minutes between two types of eye drops. Some common side effects of Brinzolamide Opthalmic drops (Azopt) are blurred vision, double vision, dropping eyelid, burning or stinging in eye, bitter or unusual taste in your mouth, dry eyes, feeling like something is in your eyes, nausea, or headache. If any of these side effects don’t subside after sometime or deteriorate, stop using Brinzolamide Opthalmic and seek immediate medical help. Some serious but rare side effects of Brinzolamide Opthalmic are swelling or redness in the eye, eye discomfort, sensitivity to light, drainage; oozing; or crusting of your eyes or eye lids, or signs of infection (fever, chills, sore throat). These are not all the possible side effects due to Brinzolamide Opthalmic. There may be others. If you experience any serious side effects, stop using this medication and get emergency medical attention. Before using Brinzolamide Opthalmic, tell your doctor about all other medication which you may be using, especially salicylates such as aspirin. This medication can interact with Brinzolamide Opthalmic. This may not be the only drug which can interact with Brinzolamide Opthalmic Suspension. There may be others. Never start a new medication without a doctor’s advice.